A rendering of the Lucas Museum of Narrative Art. 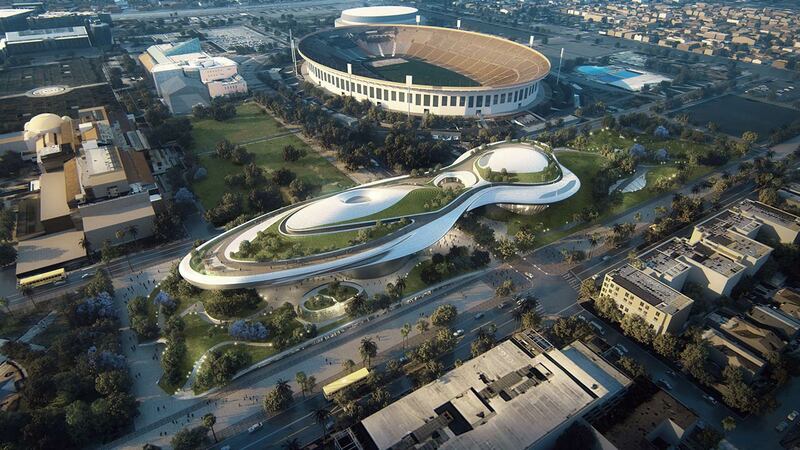 EXPOSITION PARK, LOS ANGELES -- Los Angeles will be home to George Lucas' $1-billion museum, Mayor Eric Garcetti announced on Tuesday. WATCH LIVE: Officials announce the selection of Los Angeles as home to the George Lucas museum. L.A. officials made a big push for Lucas to locate the art museum in Exposition Park rather than San Francisco. "Art exists to inspire, to move, to educate, and to excite. Thanks to George Lucas and Mellody Hobson, millions of Angelenos and visitors will enjoy an extraordinary collection anchored in storytelling - an art that carries so much meaning in the history and legacy of Los Angeles," Garcetti said in a written statement. The Lucas Museum of Narrative Art confirmed the selection in a tweet. The museum will house works from Lucas' own collection and "will celebrate the power of visual storytelling in a setting focused on narrative painting, illustration, photography, film, animation and digital art," according to the project's website. Officials said pieces will include those by Norman Rockwell, Edgar Degas and Pierre-Auguste Renoir, as well as cinema-related art from Lucas' own films, like the Star Wars and Indiana Jones franchises, and from other filmmakers. The museum is expected to be built by 2020. Lucas had originally eyed Chicago, but backed out after a prolonged legal fight and then narrowed it down to L.A. and San Francisco.